Welcome to a very special session of our nearly brand new podcast series in which we share everything we know about becoming financially independent though tax-delinquent real estate investing – in houses and land. We’ve done more than 3,000 deals through this niche field of REI and we want to help you enjoy the same success we have. We’ve already covered a bunch of terrific tax sales and tax-delinquent real estate investing information. So, today, in this special session, we’re covering how all those different tax delinquent real estate investing techniques work together. Really, it all comes down to the same point of origin – the lead – your prospective seller. So, we’re also going to talk about the many things that you can do once you are in contact with your prospective seller and how all the methods work together. Jack: All right, husband and wife team. We are here one more time this week with a special podcast episode. And, what are we going to talk about Michelle? 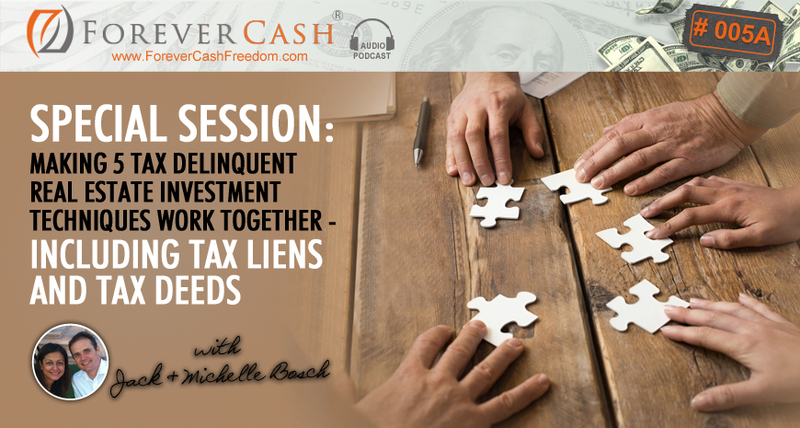 Michelle: I would love to talk about how the different tax delinquent real estate investing techniques work together. We’ve already discussed a few. And, I think it would bring it together for our listeners, for you out there listening, if we explained a little bit about how they all work together and how they all have the same point of origin–the lead, your prospective seller. There are so many things that you can do once you are in contact with this person. Jack: All right. Wonderful! Well, for anyone who has this as the first podcast you are listening to, let me quickly give you a quick update, a quick overview about what we’re actually talking about here. Michelle and I have been investing in tax delinquent real estate since the year 2002. Basically, we’re both not from here. I’m from Germany. Michelle: I’m from Honduras, Central America. Jack: Wonderful, yes! So, we are an international couple that is both American citizens now. So, we’re here to stay. I love this country. And, in the year 2002, we discovered a method that allows us to buy pieces of land anywhere from $0.05 to $0.25 on the dollar and turn them round and sell them close to market value in a matter of, often days and also how to buy and do the same thing with houses. Now, in houses you don’t get a 75 to 95% discount, but you can still buy houses for literally $1,500 or $3,000 plus these back taxes. So, when we talk about tax delinquent real estate, we talk about properties with back taxes. You have probably heard about the concept of tax liens and tax deeds. And, we have two podcast episodes. I think it’s podcast episode four and five that we talk about tax liens and tax deeds in more detail. So, you can go there and download those. But, just as a quick 30-second overview, basically, in the United States and Canada, every single piece of property has property taxes on it. And, if the owner doesn’t pay those property taxes, there is a process that the state follows to ultimately take that property away from the owner and give it to somebody else who then hopefully starts paying property taxes. But again, in that process, they recover and they recoup their property taxes which is what they ultimately want. And, that process is either the tax lien or the tax deed process. In the lien, they don’t sell the property. They sell a lien against the property. And, in the deed process, they sell the actual property. So, this is where we learned like going around 1999 to 2000, I was really unhappy or we both were really unhappy in our positions, where we were in life, in our jobs and so on. We decided that we needed to do something different. So, we started looking and researching and we came across real estate. And within real estate, we came across this tax delinquent kind of area. And, we started attending tax lien auctions and buying tax liens. Jack: …Is that people with property taxes either are in a distress situation that they need to sell the property quickly, or they just don’t want that property any more. The reason why they stopped paying their property taxes is because they have no more interest in that piece of property. So, why would we want to go attend an auction where there is a lot of competition if we could just get the information about who these people are and then go directly to them and contact them? Because if they truly don’t want that property, shouldn’t they be willing to give that property to us for a tremendous discount? And, we have proven that to be correct. That’s exactly the premise that fueled our real estate investment activity for the last, what? 13 years. Michelle: Over a decade, yeah. Jack: Go ahead. Go ahead. Michelle: I wanted to add another amazing thing about tax delinquent property lead. It’s that this is a property that is really high in equity. Usually, when a property has a mortgage as part of the mortgage payment, they escrow in property taxes. So, chances are, when a property has a mortgage, property taxes are being paid by whoever holds the deed of trust or the mortgage against the property. So here, what you have is if they are delinquent, more than likely, these are properties that have no mortgage and where there is, like I said, a high equity on the property. So, I think it’s an amazing lead. Jack: Right! Exactly. It’s kind of almost like the holy grail of real estate where you have motivated sellers with high equity properties. Jack: Great! So, now that we’ve covered that, in our podcast, in our live events and in our different programs that we have, we do cover multiple techniques. Obviously, we cover a tax lien technique. We cover tax deed techniques. We cover going around the auctions and buying land for pennies on the dollar. We go out covering and going around the auctions and buying houses. And, we are even covering a technique where you actually buy a property right before the auction, right before a tax deed auction. So basically, when they sell the property at the auction, you buy three weeks, two weeks, four week, six weeks before the auction, and then you do absolutely nothing. You let it go to auction. And, when it sells for more than what was owed in property taxes, that overage or excess proceeds as it’s technically called in the state statutes of most states, that excess in proceeds of the sale goes back to the owner of the property at the time the property was sold. So, if you buy that property three weeks before the auction, you just basically put up your feet and do nothing. You let the property go to auction and once it sells there and it sells for, let’s say there’s $10,000 in property taxes but it sells for $30,000, those extra $20,000 go to you. So, this is a method within the tax delinquent world. Basically, there is a different kind of twist to the things where you can now actually use the county auction as your selling ground as the place where the county sells your property and they do all the work and you get the proceeds, which is really kind of cool. Michelle: But, you have to be the property owner of records. Michelle: So, that means that you can’t just have a deed where you appear as a grantee, but you have to absolutely have that deed be recorded with a county before the auction takes place. Jack: Absolutely! And, that’s actually a podcast that’s going to come up in the next few weeks. We are looking forward to tell you more about that technique. But, for the other techniques, we already have created a podcast about it with more details. What we want to do in this podcast is we really want to put the five different techniques. Basically, this is the one that we call “Hidden Tax Sale Cash” where we let the property go to auction and let the county sell it and we collect the overage. We have the tax lien process. We have the tax deed process. And, we are buying the tax delinquent land and buying tax delinquent houses. So we got five different techniques and how do they work together is the question. That’s what you want to talk about right there, right? Okay. Michelle: Yeah. Yeah, exactly. And so, you start with the exact same thing–with the list of tax delinquent owners. Some of them will be five years away from the auctions. Some of them will be four, three, two, one year away from the auction. Some of them may just be weeks away from the auction. And, there will be some of these people that are in your list that you are not able to reach by mail. So, you’ll treat each of these differently. And so, you segment your list, that original list. Jack: Let me actually backtrack or just summarize that for a little bit. Michelle: I need to get used to getting into the beginner’s mind again, yeah. Jack: Right, right, right. So, we go through this every week and we are so used to it that it’s like, “Yeah, logically.” So, let me say that again in perhaps a couple of other words. So, part of what we do is we teach you in our systems, in our live seminars, in our live events and in our courses how to do these individual programs. And, what they all start with is the fact that you go and get a list of properties from the county. So, when you go and get these lists of properties from the county, in that list of tax delinquent properties or in that list of all the people that owe property taxes at the current time in that county, there is going to be people in there that just forgot to pay their property taxes because they were due last week and they are not yet delinquent and they just forgot to pay those. Michelle: Can foreclose on them. Jack: Can foreclose on them at any moment. Jack: And, in some of them, the tax lien has already started the foreclosure and they are weeks ways from being lost to foreclosure. And, if it’s a tax deed state, some of them are perhaps weeks or months away from the auction. Some of them are still years away from the auction. And in some of them, the owners just disappeared and they can’t be reached by anyone. Jack: In other words, that’s basically saying exactly what you just said. Michelle: Yes, yes. In a little bit, yeah. In the expanded form. Michelle: So then, you have this list and you have all these different kinds of property owners and you treat each of them very differently. So, you segment your list and you decide, “Okay, am I going to go after houses? Am I going to go after land?” And, you either filter out the land or filter out the houses depending on your preference. Or, if you have no preference, you just go for all of it and maybe you establish some sort of sorting or filtering mechanism based on value or the value of properties that you are looking at. Michelle: Bottom line is you’ll get a tax delinquent list that might be a list that has 8,000 records on it. It might be a list that has 30,000 records on it depending on the population density in the county that you are going after. And, if you don’t want to send out 30,000 letters, you want to basically eliminate some of these properties from your mailing list. And then, you go and send a direct mail to these people. And so, as Michelle said, if you want to do houses, well then, eliminate the land. If you want to do land, eliminate the houses. If you don’t care, then perhaps eliminate at least you want to probably go after a certain value. Jack: If you want to go after commercial property, then your sweet spot might be everything, right? It doesn’t really matter. What matters is what your selection criteria are. And then, you send out the letter. Jack: Plus, it costs them money to keep that land every year in property taxes. And, they just don’t want to pay that anymore versus somebody with a house who might have it as a rental house and they are having an income from it but, of course, with more hassles. But, that’s what we love about land. It doesn’t really matter if they are delinquent for a week or ten years. You send out some letters and people are going to call you. That is absolutely wonderful! So again, if you want to know more about the land, you can go to podcast number three. And yet, here is another link that I want to give you and that’s a quick one. I’ll mention that later again. But, if you want to know more about how this all works, you might just want to come see us live. You can come and meet with us and spend three days with us. We actually have a live event coming up right now in May. It will be held on May 1st, 2nd and 3rd in Los Angeles right at the airport or close to the airport in the airport area of LAX. So, you can very simply go there by going to www.JackBosch.com/PodcastSpecial. So, just go to www.JackBosch.com/PodcastSpecial. And, I’ll share with you or I’ll tell you later why I do call it special. But now, let’s go back to what we just said. When you do the selection of what you are going to go after–people that are more delinquent or many more years delinquent or only a few years delinquent, then you are right now setting yourself up to go after one of these five techniques that we talked about. By the way, all of this information is in that list that you get from the county. Jack: And, that’s where this podcast comes in. However, not always will you be able to get all the deals. Or, let me say that differently. You will get plenty of deals by going down that route and focusing on one of these five methods, but there will always be additional opportunities that come your way that you can take advantage off if you understand the other four techniques that we just kind of slightly covered in a little bit. But, we have the other podcasts about them. So, that’s really what you want to make sure that you understand right now. So, you have this list of tax delinquent properties and you now say, “I want to go after houses,” let’s say. So, you eliminate the land and you send out a bunch of letters. In that, you go after houses that are like three years or more delinquent because perhaps you live in California and in your state, properties are going to auction after five years. Or, if you are in Texas, you perhaps pick houses that are only one or two years delinquent because in Texas after one or two years, they have already put them for auction. Michelle: Yeah, they are fast. Jack: They are fast there. Or, in Florida, you pick properties that are four years delinquent because after a tax lien in three years, they can actually go unto the tax deed auction. Jack: So, you got to adjust to the different rules in the state that you are in. But now, you send out that letter. Jack: And now, some really interesting variations might happen where the different kinds of tax delinquent investing techniques come in to action. Michelle: Yeah! So, you send them a letter and now it’s like, “Oh, my gosh. Oh, my gosh.” The phone starts ringing. And so, you talk to your sellers and you are trying to decide based on the feedback that you get from the seller, and of course the information that you have from your list. If they are years away from the auction, the sense of urgency that they have in terms of selling this property. And so, you will eventually buy directly from the seller. And when you do, you are going to either flip this property, whether it is a house or land… You are definitely going to rehab this property if it’s a home. Or, you can either sell the land or the home with seller financing. Usually with land, that’s how we actually make our land cash flow. It’s by selling it with seller financing. And so, if they are very close to the auction and you can’t sell, and if you wanted to wholesale fast and you can’t sell on time, that’s when you pay off the back taxes. If you decide that this is a trophy property, that’s when you want to keep and you want to rehab or flip because you already have the buyer but you just cannot get it to close in time before the auction. Lastly, you actually let go of the property to the auction. And, like Jack explained earlier, you collect on the overage. Jack: So, right there, Michelle already said three different possible outcomes from sending that letter. Jack: Outcome number one was if they are years away from the auction. And, if they will call you back and you do your research and you find out that they still have a year to go, great! You got a year that you can actually buy that property without even paying the property taxes. You can get an exemption to the total policy that allows you to get title insurance without having to pay the property taxes. And then, you flip the property, rehab it, sell with seller financing and do all the things that Michelle just said. You have a full year to really do whatever you want with that property. So, this is scenario one. If you want to co-own this property because as Michelle mentioned, it is a trophy property, then yes, pay off those property taxes. But, if it’s not, if it’s something that is like, “You know what? That’s an attractive property but there are all kinds of problems with it. I don’t want to rehab it. It’s going to take me a while to sell it.” I’ll just going to let it go to the auction. So, right there, if it’s close to the auction, you have two options that you can do. And, each option is represented by another method of what we just talked to you about one of these five methods. Method one is paying it off and flipping it, which is basically like flip the house, flip the land. And, method two is let it go to the auction and collect the overage, which is the method that we call our “Hidden Tax Sale Cash” method. Michelle: Yeah! And, if you’re years away from the auction, you don’t even have to have any out-of-pocket expense in terms of property taxes. Jack: Wholesale, exactly! Then, you do the house wholesaling which again is so essential in that case. If you’re years away, it’s the same technique as if you close into it and you pay off the taxes. Jack: And, that happens quite a bit in the tax delinquent world. You actually get upwards of 10% and sometimes even 20% of your letters that you send out back as undeliverable. Perhaps, obviously 20% is rare, but you usually get up to 20%. But, about 10% of the letters come back as undeliverable. That means… Sorry to interrupt you. Michelle: Yeah, that basically means that you and no one else have been able to get a hold of this person. Michelle: So then, you can do one of two things. If you have the time, you can either skiptrace them and try to find this person because you will have very little competition. A very few people will actually go the extra step of actually skiptracing somebody. So, chances are, you’ll be the only one that will be actually reaching the seller. Or, if the property is coming up for auction very soon, what you can do is that you know that nobody has received tax bills in the past because this seller is unreachable. So, for sure, you know that when it comes for auction, this is a property that won’t be redeemed at the last moment or maybe it won’t be redeemed if there’s a redemption period after the auction. So, these are properties where you can go and safely invest in tax liens to eventually foreclose on the tax lien. Or, if it’s a tax deed auction, you can actually buy the property outright and it will wipe all liens whatsoever and you’ll be the owner of the new property. Jack: Right! Do you want me to go over that one more time because you went through that so fast? Jack: I can put it a little bit together in a couple of things or in a couple of other different words. So, this is going to be a short podcast here. But, the key is for you to really understand that there’s not just one way that you can skin that cat, but there are multiple ways to skin that cat. And, I hope I don’t offend any kind of cat lovers here but you know what I mean. So, let’s say that you sent out 1,000 letters. You got a hundred phone calls. And by the way, if you do this with land, 10% response rate is very normal. Jack: It’s very normal. And, we talked about that in the other podcasts. If you do it with houses and you send out 1,000 letters, you might get 20 or 30 phone calls or perhaps 40 phone calls or so. But, either way, you get a bunch of phone calls. For simplicity reason, let’s just say that you get a hundred phone calls on 1,000 letters. And then, out of these 100 phone calls, you treat them, you look at them and you make your offer. So perhaps, you get three deals from that. Great! So now, you have your three deals. One of them has years to go. You look at it. You wholesale it right away and you make $20 grand. Wonderful! The second one is very close to the auction and is a gem property and you pay off their property taxes. And then, you rehab it yourself or you also then sell it to somebody else and make another $20 grand. The third one is like this complex kind of thing. There are all kinds of stuff involved and you buy it. You get the deed for it. You pay him $500 for the property. And then, you let it go to the auction. And, at the auction, it sells for $10,000 more than what was owed and you make $10,000. Jack: But, no! You don’t want to throw them away. That’s the reason why we sent out letters with first-class mail even if it costs us a little bit more. When we get the letters back or the postcards with first-class mail, that’s when we get the undeliverables back. When we get them back, we go open a software or a service that’s called TLO.com. Michelle: And, that you will use that information for good and not for evil purposes. Jack: Exactly! That’s a given anyway. Anything we say here should be used for good and not for evil purposes. Jack: So therefore, within that, you are now… Yeah, she’s laughing. Michelle is laughing here. Michelle: I’m sorry. I just have to mention that. Jack: Yeah, absolutely! This is important, right? Because you can use a lot of things for evil purposes. But, we don’t want to engage with anyone that wants to do this for evil purposes. So now, you have TLO. LexisNexis.com is another one. And, there are other services like that. We like TLO because they don’t charge you a monthly fee and they only charge you when you use them. They like charge between $1 and $5 a search depending on what kind of search you do. So now, you search them. You skiptrace them and you find their new address. If you find the new address, you send them a new letter. Great! And then, they call you and they respond and so on. And then, you can still buy these properties and everything is exactly how I just said it before. If they don’t respond, guess what just happened? Michelle: Or, if they do respond and still don’t want to sell… There are some people who don’t want to sell. Jack: Right! Exactly. There are different scenarios. They either don’t respond or they respond and don’t want to sell. Or, even the second letter comes back as undeliverable. Jack: Or, you couldn’t find any second address that you could send that to. Or basically, it becomes clear that the person has passed away and there are no heirs or nobody like that. So, those are the four scenarios. So, scenario one, they call back and they want to sell. Great! You got another deal. And, you got another deal with even less competition than before because who went through that effort? Nobody. Jack: Just you. Number two, if they responded back and do not want to sell, guess what happens now? Well, let’s cover that in a second because that one gets a little bit more complicated. Well, if they don’t respond, what happens? Well, apparently, they just don’t care. Jack: The loss of property does not matter to them. So, isn’t that a great property that you might actually want to go? You can go either by the tax lien if it’s available or you can actually attend the auction and buy the lien or the actual property at the auction. Absolutely! And, how about the ones where you did not find another address or the second address came back as undeliverable again? Well, those are the clearest ones where you know for sure that if they come up for auction very soon, this property will absolutely come for auction. Nobody will redeem this property because the owners have disappeared from the face of the earth. Nobody can get a hold of them. The county can’t get a hold of them. Nobody can find out who they are. Therefore, they haven’t received the notification that their property is up for auction. And apparently, they don’t even care because otherwise, they would have updated their address. So therefore, this property comes up for auction for sure. And, that means that this is a great property for you to do your research on. And actually, instead of buying it directly from the owner, you can buy it at the tax deed auction, right? Jack: That’s a great candidate for that because you know that nobody will redeem them. Now, what happens if they answer but they don’t want to sell? Michelle: Generally, that’s just whether you’ve skiptraced them or not. Michelle: You’ve sent out the first letter and people call you back and they say, “You know what? Thank you very much for you letter but I’m not interested in selling.” And so, if they answered and they don’t want to sell, you know that this person is attached to their property. They’re not going to let it go for taxes. They will eventually redeem if the property does go to the tax lien auction. They will eventually redeem the tax lien. So, this is a perfect property or perfect candidate to go and actually buy the tax lien. Michelle: Yeah, at the auction. And, collect a very nice interest because you know that these people will eventually redeem the lien. Michelle: Yeah! This is basically if you have cash to park. Jack: Right! If you have cash to park and you want to make more money than they pay you in the bank which is almost nothing, you want to instead collect 16%, 18%, 24% and 36% interest on these tax liens. Then, this is a great strategy within the pictures of what we just talked or within the five different strategies. So, you can take the profits from one deal and go buy tax liens with that. And then, make an additional 16%, 18%, 24%, and 36% on that money. So therefore, that’s really cool! And by the way, you can even go and buy tax liens in the secondary market. Jack: If you find the property that you really, really want and that has a tax lien that’s a few years old, you can even go and contact the owner of that tax lien and then buy that tax lien from them. Michelle: Usually, the county has the owners of all the certificates of purchase buyers. They’re basically PCP buyers. And, you can contact them and see if they’re interested in selling their tax lien to you. Jack: All right. Great! So, in summary, what does this mean? By looking at the tax delinquent real estate investing or by looking at tax delinquent real estate investing, don’t look at it as simple tax lien or tax deed investing. There are many courses and many things out there about tax lien and tax deed investing but they all fall short because they all don’t include the additional ways that you can make money. Michelle: Basically, there are so many possible exit strategies and like you said, there are so many ways to “skin the cat” and all is basically coming from the original leaf. Michelle: Basically, you use the exact same method of the list. And, based on what you’re looking after or the opportunities that presents depending on the type of property, you then decide what to do with it. Jack: Exactly right! So therefore, wouldn’t it make sense that you understand more than just tax liens? Wouldn’t make it sense that by integrating all these techniques into one tool belt of techniques in a tax delinquent way, you can now send out some letters or direct mail to the owners of these properties, and now have five different ways to actually deal with these properties, depending on how the answer or lack of answer for that matter comes back to you? Wouldn’t that make sense? You literally do the same exact work of sending out the 1,000 letters or 500 or 100 letters or whatever your number is. And now, you have the potential to make two or three times the amount of deals from the same amount of leads. Isn’t that cool? So, you can literally get the list and get many more deals done. And, I think that’s really the power of behind what we do. This is the power that has allowed us to do 3,000 deals in a matter of just… I mean, what is it now? In just 13 years, we’re going to 3,500 deals by now. We actually want to invite you. I already told you earlier about that. I want to invite you to a live event. And, if you’re interested in combining all these different techniques, it totally makes sense for you to come to our live event. Because at that live event, which happens in May 1, May 2 and May 3, 2015 in L.A., we teach all these different techniques together all in one weekend. So obviously, we’ll spend the majority of time on the land flipping and house flipping. But, we’ll also teach you the tax liens, the tax deeds and the “Hidden Tax Sale Cash” method where you let property go through auction and then collect the overage. And, we have really put it all together so that by the time you walk out of that event, you’re not only feeling 10 feet tall and bulletproof, but you also literally have all those tools in your hand and you can get deals done. And typically, in order to do that, the ticket is $1,000 for that event. But, you don’t have to pay $1,000 because we’re going to give you a tremendous deal here. We’re going to give a huge discount on these tickets by just simply going to www.JackBosch.com/PodcastSpecial. Now, if you’re listening to this later on and the live event is over, you can still check out the link. We’ll probably put something up there saying like, “Hey! This is over. But, you can get on a waiting list or something like that.” We’ll figure it out. But, as of right now, this is live. If you’re listening to this before May 1, 2015, you literally can get into the live event for a fraction of the official price. And, here’s what you’ll discover at the live event. You’ll literally discover how to get tax delinquent houses for under $1,500. You’ll discover how to make $100,000 or even $200,000 still in profit this year. We’re going to lay out to you exactly what you need to do to make that happen. She’s going to show you how to get land for under $100. It’s literally like how to get land parcels worth thousands of dollars for less than it takes to go for a dinner and a movie, right? Also, we’re going to lay out to you how to build a cash flow of up to $10,000 a month in everlasting “Forever Cash,” which is the name of our podcast. Because at the end of the day, everything we do is built towards building everlasting forever income or “Forever Cash” income. So, we’ll show you how to build up to $10,000 a month in everlasting income still by the end of this year. It isn’t that hard to build it. You just got to know how to do it. Michelle: Yeah, we’re just in the beginning of the second quarter of this year. We have three quarters to go, right? Michelle: So, there’s plenty of time. Jack: There’s plenty of time. And, even going back to the basics, we even got to share with you how to attend tax deed auctions and tax lien auctions and get the best deals in there. Plus obviously, there’s networking. There’s a cocktail hour. There’s time together. And, it’s being taught by me personally. Michelle might be also there. But, it’s not taught by some other guy that we sent in. No, this is us there at the event teaching the entire event. So, if you want to come out to L.A., great! Michelle: There are no outside speakers either. Jack: Yes! No outside speakers. There’s no pitch fest or anything like that. It’s literally us teaching you the nitty-gritty ins and outs of this business and how all these five techniques work together. We’re going to go to the basics to the advanced ways of every single technique. And then, we integrate them all together so that you walk out of there with a tool belt of five different techniques perfectly working together. So, that’s what we wanted to do right now. Now, if this is not for you, great! Then, just continue listening to the next podcast. It’s totally fine. But, I did want to mention that because we only have a very, very few of these events a year. And, we did want to create the special podcast to show you how this all works together and to issue an invitation to this event for you. Jack: Pretty much covered this. Michelle: Yeah, we have pretty much covered this! Jack: All right. As always, again… Let me just mention it one more time. The link is JackBosch.com. And, Jack Bosch is spelled G-A-C-K-B-O-S-C-H.
Michelle: No, no, no, it’s J-A-C-K. My husband can’t spell. It’s www.JackBosch.com/PodcastSpecial. Jack: Podcast special. All one word, uppercase or lowercase. It doesn’t matter. Just make sure that in the Bosch, you put the C in there because a lot of people forget the C in there. So, B-O-S-C-H.
Jack: Good! With that, thank you very much! It was our pleasure to host another podcast. With that, I say thank you! Michelle: And, thank you very much! Outro: Thanks for listening to the forever Cash Freedom Podcast, subscribe now for a future content packed episodes on how to push the ejector seat on your financial hamster wheel and discover a radical way to freedom and wealth through cutting edge real estate investing strategies. To learn more about living the Forever Cash lifestyle, investing smartly and becoming financially free, visit www.forevercashfreedom.com to claim your free Forever Cash starter kit today.